Argyranthemum (marguerite, marguerite daisy, dill daisy) is a genus of flowering plants belonging to the family Asteraceae. Members of this genus are sometimes also placed in the genus Chrysanthemum. The genus is endemic to Macaronesia, occurring only on the Canary Islands, the Savage Islands, and Madeira. Argyranthemum frutescens is recorded as a food plant of the leaf-mining larva of the moth Bucculatrix chrysanthemella. Varieties and cultivars of Argyranthemum (sometimes listed under A. frutescens) are widely sold as garden plants, for summer bedding or containers. They produce prolific single- or double-flowered daisy-like flowers in shades of white, pink, yellow and purple throughout summer. They are generally half-hardy, and can be grown from seed or cuttings, or purchased as young plants to be planted out after all danger of frost has passed. 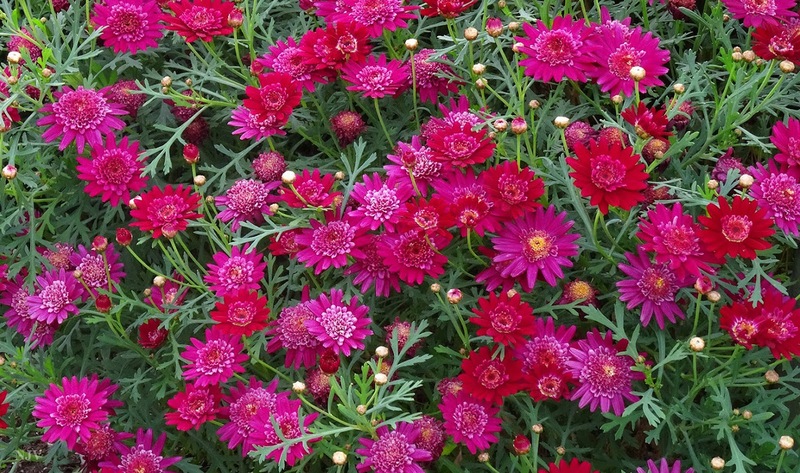 Several cultivars have gained the Royal Horticultural Society's Award of Garden Merit. Illustrated here is the cultivar Marguerite Daisy 'Madeira® (Argyranthemum frutescens) 'Crested Merlot', which blooms prolifically. This is an easily grown variety that is particularly suited for pots and planters.